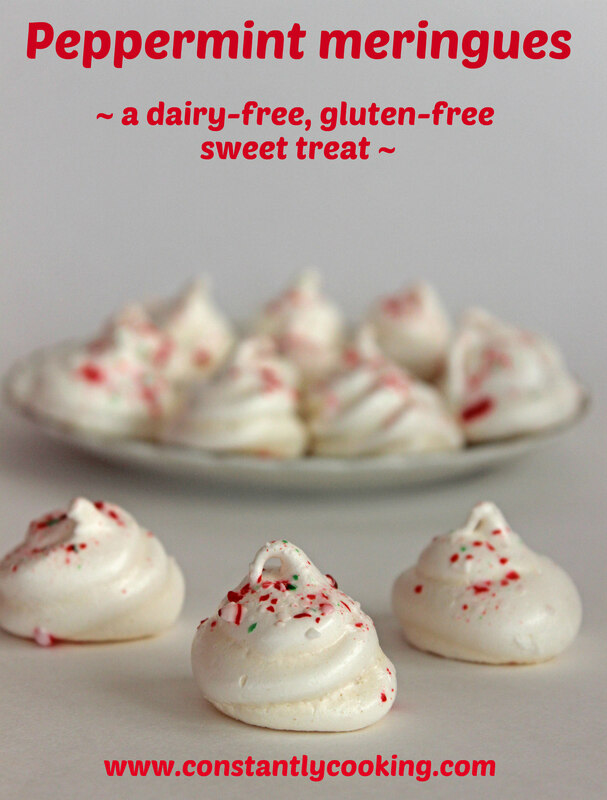 Little meringues are the perfect sweet treat to have on hand, especially during the holiday season. They store well for weeks if placed in an airtight container, and their delicate texture and flavour make them a hit with young and old. Best of all, they are gluten and dairy free so everyone can enjoy them. Each year, I make these by the tableful for eating and home and gifting to others. While you can double the recipe, I find it’s best not to beat up more than 4 egg whites at a time as the mixture will start to deflate in your warm hands while piping out the cookies onto the baking trays. Also be sure not to add the peppermint extract until the egg whites have formed stiff peaks as the natural oils in the extract will impede the whipping process. Preheat oven to 225F. Line a large baking tray with parchment paper and set aside. Put egg whites in a medium-sized bowl. Beat with an electric mixer for one minute, then add salt and cream of tartar. Beat for 1 – 2 minutes longer until soft peaks form. Add sugar very slowly – about a tablespoon at a time – beating constantly. It should take you at least one full minute to make the sugar additions. Beat for 3 – 4 minutes longer until stiff peaks form. Add peppermint extract and beat for 20 seconds. Spoon the mixture into a large zippered food storage bag and seal. With scissors, snip off one corner of the bag, making an opening about 1/2 inch (1.25 cm) in size. Gently pipe the meringue mixture into small mounds about 1” (2.5 cm) high onto the prepared baking tray, spacing about 1 inch apart. 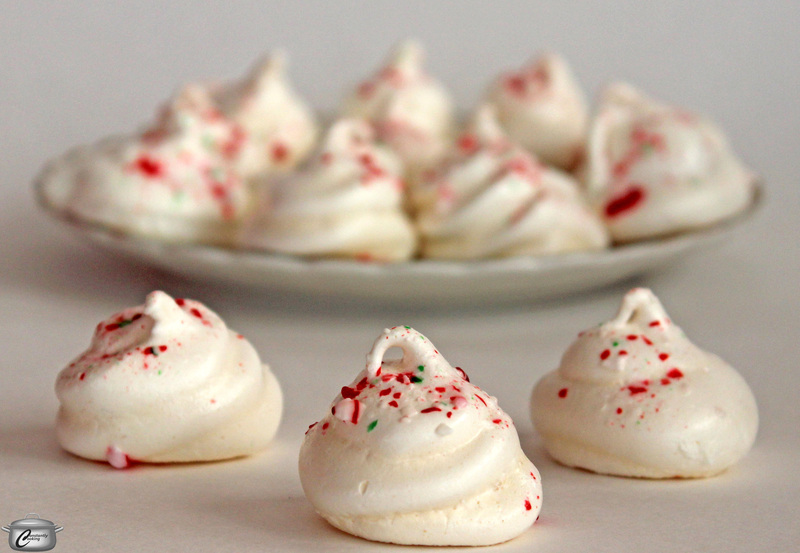 Sprinkle 1/2 teaspoon (2.5 ml) of crushed candy canes over the top of each meringue. Bake in the preheated oven for 60 – 75 minutes, or until completely dry. Let cool completely then transfer to an airtight container. Store at room temperature. Makes approximately 2 dozen small cookies. This entry was posted in baking, cookies, Edible Gifts, gluten-free and tagged baking, candy canes, Christmas, Christmas cookies, cookies, dairy-free cookie, gluten-free cookie, Paula Roy, peppermint, what to do with leftover egg whites. Bookmark the permalink. Scrumptious is such a Willy Wonka kind of word, don’t you think?